You are currently browsing the archives for the Claire McCaskill category. A closer look at 2018: What wave? Julie Kelly’s article for the Federalist demolishes the Democrats’ chanting point that it’s a matter of when, not if, Democrats retake the US House of Representatives. That’s the first time I’ve read that this cycle. If that holds, Democrats won’t retake the House. On the Senate side, that might indicate a red wave of historic proportions. Prior to this, I’ve been predicting Republicans gaining 4-5 seats net in the Senate. If the enthusiasm gap disappears, Republicans might have a big red wave staring at them. Instead of just flipping seats in West Virginia, Missouri, North Dakota, Indiana and Montana, the GOP might flip Florida, Minnesota, Wisconsin and Pennsylvania, too. While white college graduates favor Democrats by nine points, non-college whites prefer a Republican congressional candidate by nearly 30 points, devastating news about a core constituency of the Democratic Party going forward. A slim majority also said gun violence has no effect on whether they will vote Republican or Democrat. So it looks like the nonstop media exploitation of the Parkland school shooting did not work for the Left. I don’t see a wave, be it blue or red. There just isn’t an appetite for a major change. The economy is getting stronger, which usually leads to not rocking the boat at the voting booth. Is Tammy Baldwin in trouble? When asked which Democrats in red states are in trouble, most political junkies will rattle off the names of Joe Manchin, Heidi Heitkamp, Claire McCaskill and Joe Donnelly. I’m not here to question any of those names. I’m here to remind people that this list isn’t comprehensive. This article reminds people that Tammy Baldwin has ‘earned’ a spot on that list, too. As I’ve said in the past, the Marquette University poll is the gold standard in Wisconsin, just like the Des Moines Register poll is the gold standard in Iowa. If you want the low-down on the state of the races in Wisconsin, the Marquette poll is the most accurate. According to the latest Marquette University poll , “a recent Marquette Law School poll of registered voters found Baldwin’s favorability rating dipped three points over the past year, from 40 to 37 percent, while her unfavorability rating climbed from 35 to 39 percent.” Simply put, incumbents with approval ratings under 40% rarely win re-election. That’s because people already know them. There’s little they can do to change people’s opinions, too. Baldwin responded to a question about her low popularity by asserting, “We’re a terribly polarized state, which I hate. When I started in political life running for office, people were ticket-splitters. There wasn’t the partisan polarization that we see,” claimed Baldwin. Twenty years ago, the Democratic Party hadn’t gone off the rails. People could consider splitting tickets. Now that Democrats are lunatic demagogues, nobody thinks about ticket-splitting. Sen. Baldwin faces a tough re-election campaign. The Common Sense Coalition’s amendment is pretty much a bait-and-switch con job piece of legislation. For starters, amnesty for DACA recipients is immediate. That isn’t surprising. Next, building President Trump’s wall isn’t a priority. On Pg. 51 of the amendment, we learn that $1,571,000,000,000 is appropriated to build President Trump’s wall in 2018. Further, $2,500,000,000,000 is available to be appropriated in each year starting in 2019 and going through 2027. Further, the legislative language states that “the amount specified in subsection (d) for each of fiscal years 2019-2027 shall not be available for such fiscal year unless (A) the Secretary submits to Congress, not later than 60 days before the start of such fiscal year a report setting forth a description of every planned expenditure…, (B) a description of the total number of miles of security fencing… etc. In other words, they’re limiting the speed with which the wall can be built. Further. they’re making it possible for future Democratic administrations to kill the building of the wall. It’s worth noting that a significant percentage of these senators are either retiring or will be defeated this fall. Sen. Donnelly fits that description. Jeff Flake definitely fits that description. Joe Manchin is inching closer to fitting that description. Heidi Heitkamp definitely fits that description. Claire McCaskill and Bill Nelson fit that description. 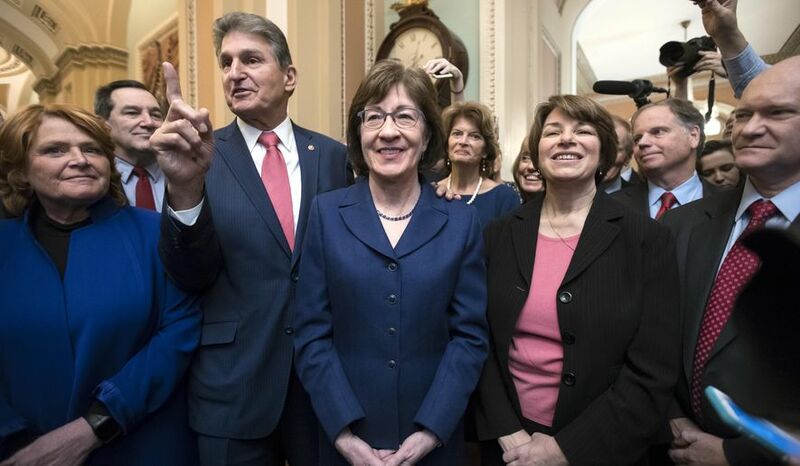 The senators from New Hampshire don’t exactly fit the description but they’re getting there. Bob Corker fits that description. Simply put, most of the senators in the Common Sense Coalition won’t be in the Senate a year from now. That doesn’t mean they don’t have the right to vote. That’s their right until their replacement is sworn in, either after their retirement or their defeat. What it means, though, is that members of the Coalition don’t care about national security. They certainly aren’t interested in listening to the people. Thus far, they haven’t listened to the people. The Secretary shall transfer, 8 from the Fund to the “U.S. Customs and Border 9 Protection—Procurement, Construction and Improvements” account, for the purpose described in 11 subsection (a)(1), $18,000,000,000, of which— 12 (A) $1,571,000,000 shall be transferred in 13 fiscal year 2018; 14 (B) $1,600,000,000 shall be transferred in fiscal year 2019; 16 (C) $1,842,000,000 shall be transferred in fiscal year 2020; (D) $2,019,000,000 shall be transferred in 19 fiscal year 2021; (E) $2,237,000,000 shall be transferred in fiscal year 2022; (F) $1,745,000,000 shall be transferred in fiscal year 2023; 177 (G) $1,746,000,000 shall be transferred in fiscal year 2024; (H) $1,776,000,000 shall be transferred in fiscal year 2025; (I) $1,746,000,000 shall be transferred in fiscal year 2026; and (J) $1,718,000,000 shall be transferred in fiscal year 2027. Barring an act of Congress, the money for President Trump’s wall will be appropriated this year. The Common Sense Coalition’s bill appropriates approximately $1,700,000,000,000 this year, then requires separate appropriations in the years following to build the wall. The Grassley bill appropriates the money immediately. It’s worth noting that Democrats have the proverbial gun pointed at their heads. If Democrats don’t agree to President Trump’s conditions, DACA collapses and the recipients hold Democrats responsible. Remember this? The chances for a repeat of that scene is high if Democrats don’t deliver.